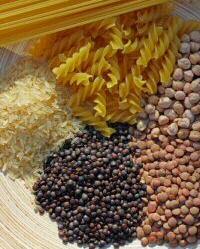 Whole grains, such as rice, oats, corn, or pasta, are great for energy. Whole grains provide protein and fibre, along with complex carbohydrates for energy. They are a good source of B vitamins and minerals. Whole-grain breads, brown rice, whole grain pasta, corn, millet, barley, bulgur, oatmeal, and quinoa are all great choices. Aim for 5 or more servings per day. Serving size: 1/2 cup hot cereal; 1 ounce dry cereal (by weight), 1 slice bread. Legumes (i.e., beans, peas, and lentils) are loaded with protein, minerals, and fibre. Legumes -all types of beans, peas, and lentils- are great sources of fibre, protein, iron, calcium, zinc, and B vitamins. This group includes chickpeas, baked and refried beans, black beans, navy beans, lentils in every variety, peas, and the full range of soy products: tofu, soymilk, tempeh, and tofu-based veggie burgers. Not only are legumes free of cholesterol and animal fat (like all foods from plant sources), but they also help reduce cholesterol and stabilise blood sugar. Aim for 2 or more servings per day. Serving size: 1/2 cup cooked beans; 4 ounces tofu or tempeh; 8 ounces soymilk. They are rich in nutrients your body needs: vitamins and minerals, fibre, and special plant nutrients called phytochemicals. They don't contain any cholesterol or animal fat at all. The same is true of grains, fruits, and legumes. Some of the most nutritious vegetables include dark leafy greens like broccoli, collards, kale, mustard and turnip greens, spinach, chicory, and bok choy. 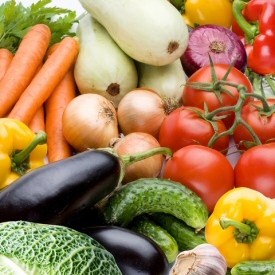 Other highly nutritious choices are the yellow-orange vegetables, such as carrots, squash, yams, and pumpkin. Aim for at least 4 servings or more per day. Serving size: 1 cup raw; ½ cup cooked. 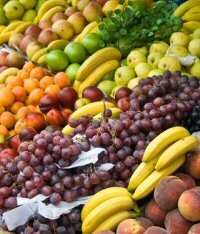 Fruits, from apples, oranges, and bananas to mangoes, papayas, and watermelon, provide vitamins and minerals, too. Fruit is loaded with fibre, vitamins (especially vitamin C), minerals, and phytochemicals-special disease-fighting compounds found in plants. Citrus fruits, melons, apples, pears, bananas, and strawberries are all good choices, and you'll find many more in the produce department. Choose whole fruit over fruit juice, which has more calories and less fibre. Aim for 3 or more servings per day. Serving size: 1 medium piece of fruit; 1/2 cup cooked fruit; 1/4 cup dried fruit; 4 ounces juice. Getting complete nutrition is simple. Start by building your meals from fruits, vegetables, grains, and legumes as mentioned above. Protein: Beans, vegetables, and grains provide plenty of protein, even without intentionally combining them in any particular way. Some that are especially protein-rich include beans, spinach, broccoli, asparagus, mushrooms, and soy products. Calcium: Calcium, along with vitamin D, is necessary for strong teeth and bones. It also plays a major role in proper muscle and nerve functioning. Calcium is found in green leafy vegetables, such as broccoli, kale, or collards, as well as in beans (see more healthful sources of calcium in the chart below). Reproduced from Klaper, Michael M.D. Vegan Nutrition: Pure and Simple, Fourth Edition, Maui, Hawaii: Gentle World, 1998, p.38. Linoleic Acid (omega 6) - safflower, sunflower, corn, evening primrose, hempseed and soy oils. Alpha-linolenic Acid (omega 3) - flaxseed, pumpkin seed, walnut, hempseed, soy and rapeseed oils. A sufficient intake of the necessary vitamins is necessary for the health of us all. The major vitamins can be found from the non-animal food sources listed below. Vitamin B-6: a water-soluble vitamin, helps use protein to build body tissue and aids in the metabolism of fat. The need for vitamin B-6 is directly related to protein intake. As the intake of protein increases, the need for vitamin B-6 increases. Good sources are nuts, wholegrains, oats, muesli, pulses (peas, beans, lentils), green leafy vegetables and dried fruit. Vitamin B12: Necessary for proper nerve function and maintaining healthy red blood cells. It also plays a role in cell division. It is the only vitamin that is not readily available from non-animal sources. It is required by the body in very small amounts and can be gained from the following sources: Vitamin B12 supplements, fortified yeast extracts, soya milks (look for Vitamin B12 in the ingredients), TVP products, some breakfast cereals - check the labels to see which ones have B12 added to them. Further in-depth information about vitamin B12 and a vegan diet can be found here: B12. Vitamin C: Has a number of important functions. For example it helps protect cells and keeps them healthy and also helps the body absorb iron from food. Sources include: Redcurrants, blackcurrants, berries, citrus fruits (e.g. oranges, lemons, grapefruit), green vegetables, potatoes. Vitamin D: Plays a critical role in bone health, and helps regulate calcium and phosphorus absorption by the action of sunlight on the skin. Can be found in vitamin D-fortified foods like vegan margarines, fortified soya milks and vitamin D supplements. Vitamin E: A fat-soluble vitamin, protects vitamin A and essential fatty acids from oxidation in the body cells and prevents breakdown of body tissues. It is found in nuts, seeds, whole grains and flours and vegetable oils. Folic Acid: Folic acid is a B vitamin that aids in new cell development, and for this reason adequate supplies are especially important for pregnant women. Wheatgerm, raw/lightly-cooked green leafy vegetables (eg. broccoli, spinach), yeast, yeast extracts, nuts, chick peas, green beans, oranges, dates, avocados, tomatoes, whole grains. Many food manufacturers now also fortify white flour, cereals, bread, corn, rice and noodle products with folic acid - check labels for this. Nuts, seeds, pulses (eg. soya beans, tofu, miso - fermented soybean curd, haricot beans), molasses, carob, parsley, figs (dried), sea vegetables, grains (eg. oatmeal), fortified soya milks are all rich in minerals. Iron: Needed by the body to produce hemoglobin, and it plays a crucial role in oxygen transport in the body and in the formation of enzymes. You'll find plenty of iron in green leafy vegetables and in beans and other legumes. See the chart below. Reproduced from Klaper, Michael M.D. 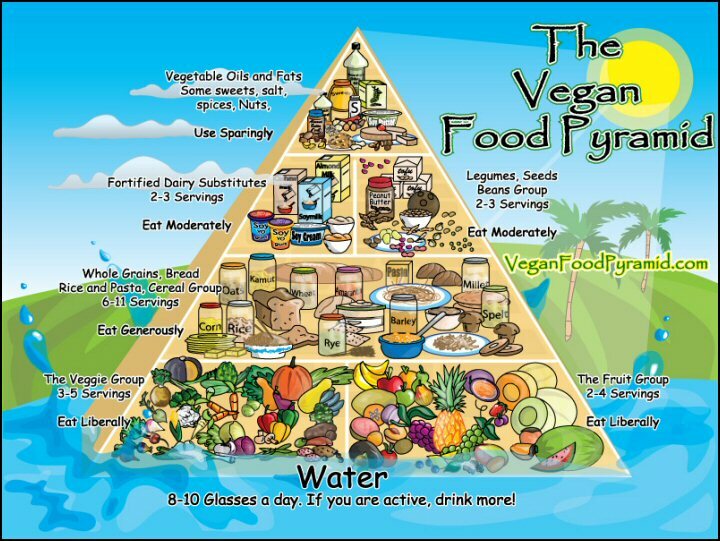 Vegan Nutrition: Pure and Simple, Fourth Edition, Maui, Hawaii: Gentle World, 1998, p.39. Magnesium: Works with calcium to keep your muscles functioning properly, including your heart muscle. The best vegan source of magnesium is pumpkin seeds. Other good sources are flax seeds, almonds, peanuts, quinoa and spinach. Most seeds and nuts and many beans and whole grains contain some magnesium. Zinc: Needed for normal growth and development, and plays a role in wound healing and immunity. It has antioxidant properties and helps protect the liver. Zinc is found in seeds, nuts such as cashews and almonds, whole grains, and chickpeas, pulses, tofu, miso, peas, parsley, bean sprouts (alfalfa). Potassium: Helps your muscles and nerves function properly and maintains the proper electrolyte and acid-base balance in your body. Very good sources of potassium include chard, mushrooms, spinach, fennel, kale, mustard greens, Brussel sprouts, broccoli, squash, blackstrap molasses, bananas, apricots and tomatoes. Iodine: A trace mineral that's important for healthy thyroid function. Table salt is the most common and reliable source of iodine in Americans' diets. (However, sodium in processed foods usually does not contain iodine and iodised salt is not used in the UK.) If you don't consume table salt, you can get iodine from a multivitamin or from kelp tablets. Seaweed is a good source of the trace element.